An attractive variety, producing lovely greenish-white flowers in late winter; stunning variegated foliage looks like it is frosted with snow; excellent visual contrast for the garden or border fronts. Snow Fever Hellebore features showy nodding creamy white cup-shaped flowers with light green overtones at the ends of the stems from late winter to early spring. It’s attractive oval compound leaves remain dark green in color with showy white variegation throughout the year. The fruit is not ornamentally significant. This fragrant, evergreen ground cover would makes a nice addition to the landscape. The bright red berries are quite persistent and stay on for months at a time. Will tolerate drought, sand and dry soils. Prefers a well-drained soil with a pH of acidic to slightly alkaline. Small evergreen shrub with many erect branches to form a mound. 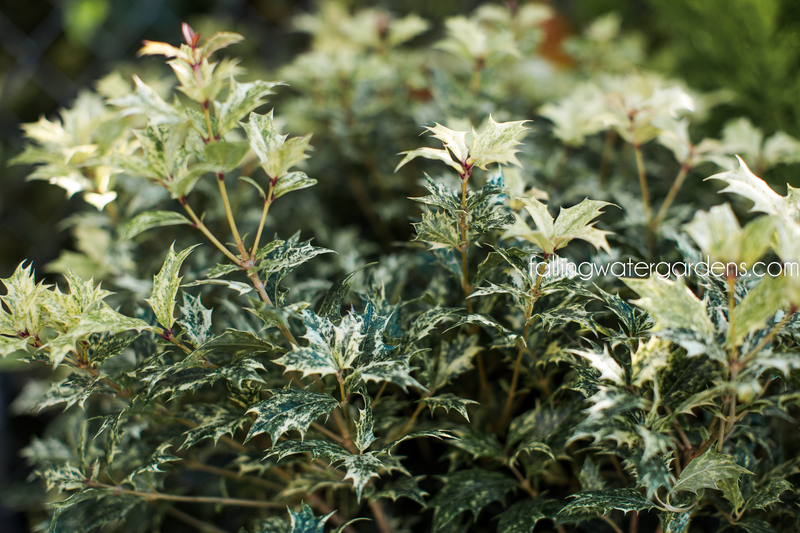 Leathery holly-like leaves are irregularly spined and dark green edged in creamy-white. An excellent hedge, border or foundation plant.